outer rings is due to the finely divided material. But is there a similar cause of the two rings? A newly discovered blue ring around the gas giant Uranus compares extremely well with the blue ring of Saturn, but astronomers lack a credible theory that can explain both. It is now known that rings are the rule among the gas giants—Jupiter, Saturn, Uranus and Neptune—and the ring systems are dominated by a reddish hue. The color is apparently related to both particle size and composition. Relatively large particle sizes—many microns to meters across—are more abundant in the reddish rings, and this fact is at least partially responsible for the rings’ color. But it is also believed that some of the material of the rings themselves may be of a reddish hue—“perhaps from iron”. There are two exceptions, however. Last year astronomers discovered that the outermost ring of Uranus is bright blue, and the color reminded them of the E-ring of Saturn, which displays a virtually identical hue. The discovery of the blue ring came after combining ground-based near-infrared observations by the Keck Telescope in Hawaii and visible-light photos taken by the Hubble Space Telescope. 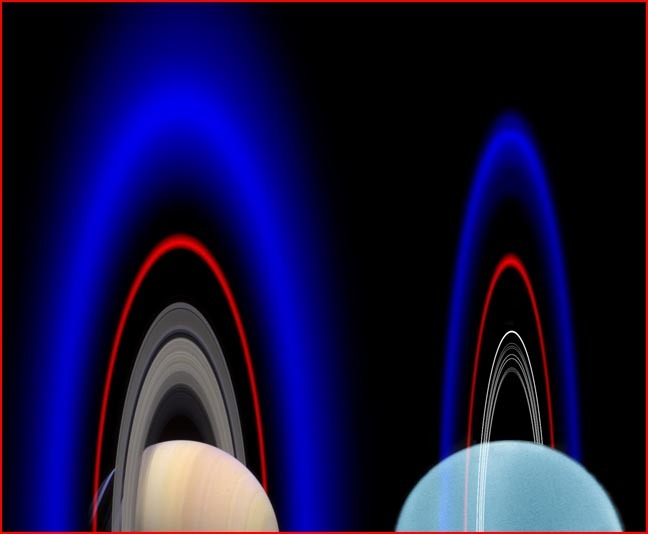 According to a UC Berkeley press release reporting on the work of four astronomers (recently reported in the journal Science), “The similarity between these outer rings implies a similar explanation for the blue color”. But this poses a problem because Saturn's blue E ring is now explained by the presence of the small moon Enceladus. In the past year, astronomers observed bright plumes of dust, gas, and ice particles from Enceladus, feeding the E-ring. Though they had long assumed that Enceladus, just 300 miles in diameter, was cold and dead, they were forced to the conclusion that some mysterious internal process was still alive in the moon, energizing the jets. Curiously, a small moon of Uranus, called Mab, occupies a remarkably similar strategic position in relation to that gas giant’s blue ring. But a “similar explanation” to that of the blue ring of Saturn is inconceivable under the astronomers’ assumptions, since the proposed internal dynamics on Enceladus had already strained credibility, and Mab is just “a small, dead, rocky ball, about 15 miles across—one-twentieth the diameter of Enceladus”. Nevertheless, as noted by one of the authors, "Arguing by analogy, the two outermost rings, the two rings that have satellites embedded in them, are both the blue rings. That can't be coincidental, there has to be a common thread of dynamics that is causing both of these phenomena”. Scientists agree that the reason for the blue hue of the two rings is the presence of smaller particles, “most less than a tenth of a micron across—a thousandth the width of a human hair— that scatter and reflect predominantly blue light”. From an electrical vantage point, then, a unified explanation is immediately available. As we have already noted in discussion of comets, an electric process, called “cathode sputtering” in industrial applications, produces the most finely divided particles that can be technically achieved today. The process is active on comet nuclei, producing the “astonishingly” fine dust observed in more than one encounter with a comet. In fact, the blue color in the ion tails of comets should be compared with the blue rings of Saturn and Uranus. Now that the Cassini probe of Saturn’s realm has revealed the comet-like plumes of Enceladus—most economically explained as electrical jets—it is not unreasonable to suppose that these jets are feeding the same kind of exceptionally fine dust into Saturn’s blue ring. While the small size of the Uranian moon Mab positively excludes internal processes, all of the facts are consistent with electrical activity similar to that observed on Enceladus. Hence, a similar result is to be expected. It should not be forgotten that we see the same process on Jupiter’s moon Io, which is known to eject material into the Jovian plasma torus. But in this case, the result is different because the discharge is so energetic that the surface material is not merely being 'machined' but is undergoing nuclear transformation. Predominantly, the oxygen nuclei from water ice combine to become sulfur. And it is the fallback of colorful sulfur molecules that creates the unique 'pizza' look of Io. The jets from these very different moons are not due to some speculative internally driven process. These three moons (together with Neptune's moon, Triton) are simply dissipative elements in the electrical circuit that connects the Sun to the planets. It is electrical energy flowing in the solar wind circuit that drives the 'volcanoes' or jets on these frozen bodies. It is the same electrical energy flowing in the solar wind circuit that results in the spectacular auroras and phenomenal storms and wind speeds of the giant planets. These phenomena will remain a puzzle to planetary specialists so long as they view planets as isolated and electrically neutral bodies. With these considerations in mind, we can predict with confidence that once the capability to look closely is in hand, astronomers will discover that the little moon Mab has an electrically machined surface and comet-like jets that sustain the Uranian blue ring.